We, as colour experts, know the difference between an Ombré and a Balayage. But we get asked this question ALL THE TIME! 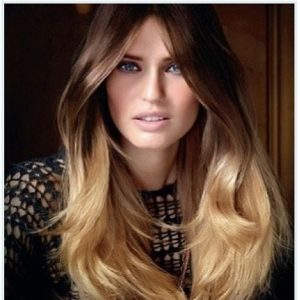 Or we get an appointment request for an “Ombré Balayage” and we are thinking, “Well, which one? !” So, we are here to set the record straight and share with you the difference between the two styles. The word ombré comes from the French word “shadow”. Ombré is the actual style. It is the transition of a lighter shade from a darker shade. Generally, ombré’s work best on brunettes because it is the least subtle of all the techniques, a sombré is what we would see on blondes. That technique is more subtle, hence the word sombré. Ombré is great for the more daring girl, it is definitely more noticeable and typically more maintenance. Ombré is kind of like colour blocking, there are no dark pieces left on the bottom to help keep it natural, just a nice transition between the colours. While the ombré is a beautiful look, it is also something that needs to be done right! A bad ombré really isn’t pretty – and please don’t try to do it on your own! That’s what is called Homebré and nobody wants that! The two are very similar, but there are very obvious distinctions between the two! The word “Balayage” comes from another French word meaning “to sweep”. Now, if you have ever seen someone get a balayage in the salon, this probably makes sense to you. When applying the colour for a balayage, you sweep the colour through small triangle sections of the hair onto the hand, a board or foil, giving it the natural transition down into the lighter colour. In Balayage, there are dark pieces left on the bottom to create dimension and a more natural look. This technique looks like natural sun-kissed highlights throughout the hair. The transition is more natural and it is less maintenance than an ombré. Now that you know the difference, are you comfortable with changing your hair up? ….We hope so! Make an appointment today and get on trend! We look forward to hearing your comments and seeing your shares!